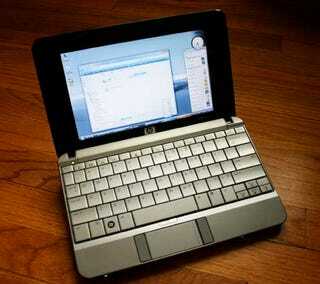 The Gadget: HP's response to the Asus EEE PC, the HP 2133 Mini-Note. The Price: $499-$750. The ($750) tested version packs a 8.9" screen, 1.6Ghz processor, 2GB of RAM, 120GB HD and Windows Vista Business. The Verdict: It's a remarkable little laptop if you can stand the extra weight and price over the Eee PC 4G. It starts with Vista. It's not that you can't do basic functions in Linux (or load XP onto the Eee), but the Mini-Note note not only runs Vista, it runs Aero at a pretty reasonable level. It's not the speediest computer on the planet, but you're never left holding your breath for programs to open or to properly multitask. And it's extremely comfortable to use. The keyboard is rated at "92% of full-sized QWERTY," and the keys even have nice rebound off your fingers. (My biggest problems typing arose when I narrowed my finger pattern, subconsciously anticipating the keyboard to be smaller given the size of the computer.) I wish the trackpad were so well designed. It works, but—and this will sound petty—my finger seems to stick to its finish. That wouldn't be a big deal, but you really have to crank up the sensitivity to compensate for the tiny pad in the first place. The screen is gorgeous at 8.9" and 1280 x 768 resolution. Side by side against the Eee, it's night and day, like comparing a PSP to a Nintendo DS. It's still not quite big enough for me, as I constantly move the screen closer to my face. But it's sharp, bright and contrasty. You can't fault it for quality. Compared to the Eee: The HP I've tested runs $350 more than the stock, classic Eee 4G. That's almost double the price. But you will need to add more RAM to its 512MB base on the Eee, and its stock Linux package just isn't acceptable for advanced use. I think that most Eee owners will find that $400 price point too good to be true. Then again, my Eee weighs so much less than the Mini-Note. I'm not sure that HP's advertised sub-3lb metric counts in my configuration (and a 6-cell battery). Because it just doesn't have that throw-it-in-your-purse-manbag lightness. It feels like it weighs two Eees. Loaded with Vista and packing 100+GB of storage, the HP Mini-Note is a full-blown laptop in a little package. The Eee PC 4G is not (pending some modification).